in this entry I want to showcase how you can plan and prepare for a perfect getting ready. First of all, the getting ready is one of my absolute favourite "moments" of the day. There is a tense, yet excited and prosperous atmosphere in the room. There are so many natural, authentic and pure emotions, giving away so much about you and your wedding. It's the ideal entry to a rock solid Blockbuster lovestory! Many of you know those beautiful inspirational Getting Ready shots on Instagram and Pinterest. However, these pictures and settings don't come by chance. There is much planning and preparing needed and no matter how big or small your budged is, you can get your job done and make sure to set the best conditions possible for great getting ready shots. 1) Choosing the "right room"
I know that there might me limitations sometimes, however, most often you will have a choice event if you think you don't. More about that at the end. First and foremost, choose a room that has the potential for much light. Ideal are big window, or glass door front. Available window light can be magic so this will give you a great start to good images. Choose a room that is fairly spacious and is not cluttered, unless it is very stylish furniture. 2) Get unnecessary stuff out of the way. The preparation of a wedding is stressful but you also know the date and have time to plan ahead. Space is crucial in the room that you are getting ready so if there is furniture that isn't especially charming, get it out and cram another "unimportant" room for a while. Imagine yourself standing in front of the window, and spreading your vail/dress behind you. Would there be room to take a full picture of all the beauty? Small things, like getting rid of a couch, make big differences! One of the things that is most common in getting ready pictures and for that matter can easily be avoided are suitcases, open bags, dirty clothes, bottles, tissues, and other unwanted stuff. Make sure that you keep the room of your getting ready as clean as possible. 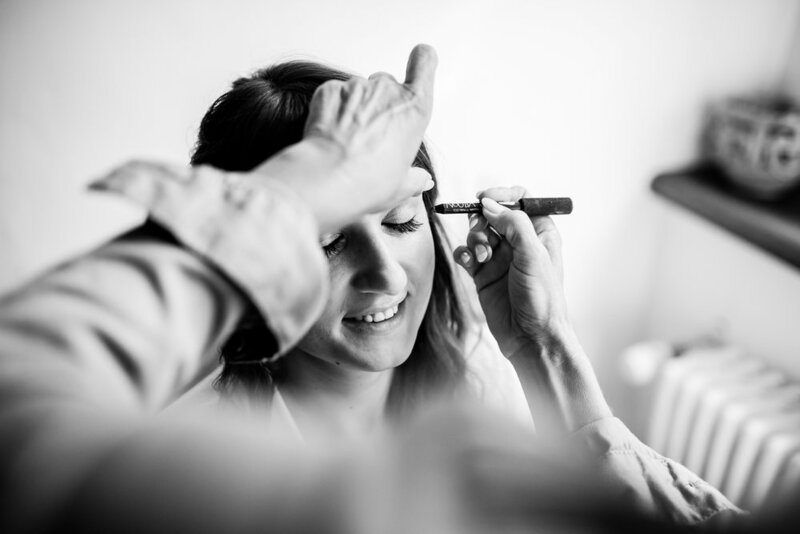 On the other hand, I always shoot lovely details during the getting ready. So have your dress (on a nice hanger), shoes, rings, invitation cards, bouquet, jewellery and other important details ready, if not arranged. 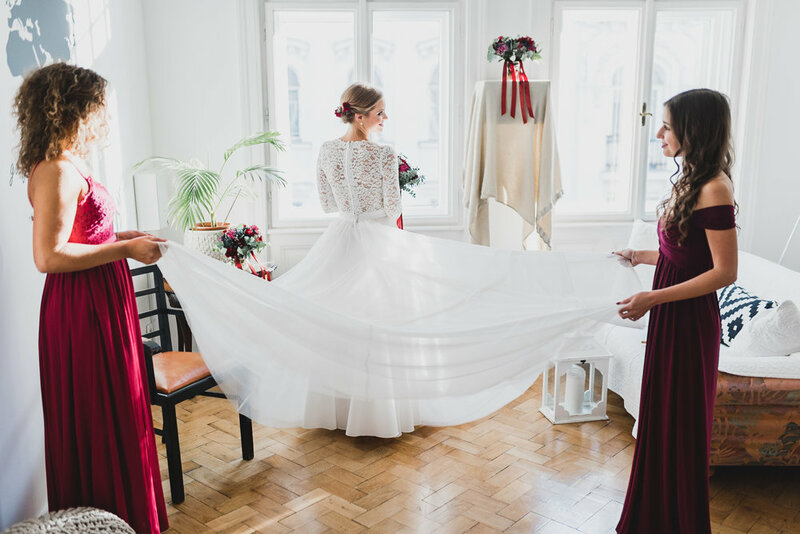 If you have a particular setting in mind, you can st it up beforehand, otherwise a creative photographer should be able to create his preferred set up. If you can't move the bed, make sure it is ready and made when the photographer arrives. If it is all neat and tidy it actually can be an advantage! But make sure that it looks good and fresh. Iron over it or let the venue manager take care of it before you start the getting ready. It will give your pictures a clean and organised look. On a side note. 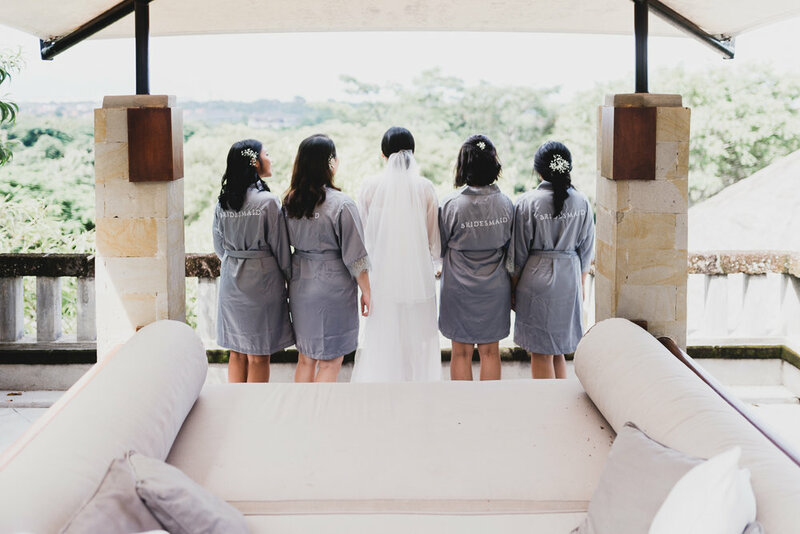 Many brides ask what to wear during the getting ready. I think you can't go wrong with a robe or Kimono. It is pleasant to wear and looks great on camera. Same for your bridal party. Mostly the make up artist arrives before the photographer and chooses the spot for setting up. First, think about the location before, two, set up by the window (as they will do most often anyways as they MUA's need good light as well) and three, turn a bit sideways as if you were looking out of the window in an angle. This can create cool split lighting and makes for great images. If you have a nice old chair, a specifically beautiful make up table, or a mirror, get it in there. Asking is half your rent! Now, remember how I told you about your "limitations" in the beginning. You always have more possibilities that you think. If you are getting ready at a venue you always have alternatives. Don't forget that you are getting married and it's your day! Most likely everybody will be nice and try to help you as much as possible. So often it's just about asking nicely! Ask if you can see the "board/conference rooms", "suites" or "event rooms" that you could user for getting ready instead of your own room. They will be clean and set up most of the time and you don't have to get your personal "stuff" out of the way. Last but not least, don't stress toooooooo much about all that. So far, I have always managed to do a good job even if the conditions were less than ideal! If you have a good photographer, he will arrange and if necessary, even move stuff. But you make his life much easier if things are thought about! I hope this could help you and hope you will have a fantastic "getting ready". If you want more tipps on planning your wedding, download my free Guide "10 Tipps zum perfekten Hochzeitsfotografen"
In order to send you the guide, I will need you E-Mail address and contact information. Newer PostCouple Shooting in Weiden am See - "Das Fritz"